Thanks to Me To You I can offer my readers an exclusive discount of 20% simply use this voucher code at the checkout mummybeautiful20 which gives 20% off until Midnight on Fathers Day. About Me to You Online. 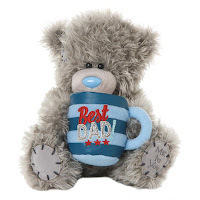 Me to You Online is the largest specialist retailer of the adorable Tatty Teddy ranges. Established in 2006 and holding nearly 10,000 different products featuring the Me to You Bear brand, customers are guaranteed to find the perfect bear, card or gift for a huge range of occasions. They also hold a large catalogue of past releases and Limited Editions not available as standard stock.